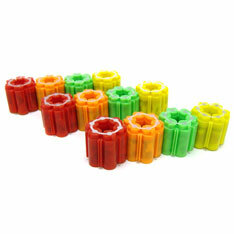 Reload the confetti pistol party poppers (item PG998) with these confetti filled reloads. Sold by the dozen with 6 shots per reload. $6.00 per dozen for 25 dozen or more. $5.15 per dozen for 50 dozen or more.